Our friends over at Studio 2 Publishing have found the last remaining copies of the full-color print run of Jadeclaw, the legacy stand-alone game we made with our first crowd-funding, back before everyone just called it “Kickstartering”. There’s only a few of these left, and with our new books about to arrive, we need to make room in the warehouse. From now until October 31st, you can order print copies of JADECLAW Legacy from Studio 2 for only $4.95 plus shipping and handling. After that, these printed copies will no longer be available for sale, anywhere. This is your last chance to get your own copy of gaming history! 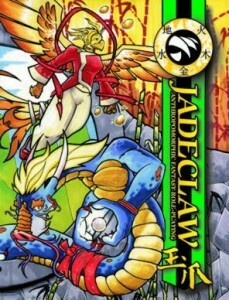 Note: This sale is for the Legacy JADECLAW game, which doesn’t work with the current IRONCLAW, BOOK OF JADE, or anything else we currently print.